Michael Beasley is a User Experience Architect at ITHAKA, putting his passion for user research and analytics to work on a platform that millions of people use to access scholarly journal articles. He has written a number of articles about analytics for UX and the book Practical Web Analytics for User Experience. 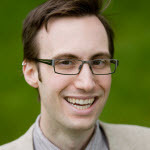 Michael has also served as president of the Michigan chapter of the UXPA, and is the co-founder of Ignite UX Michigan. Michael has an MSI in Human-Computer Interaction from the University of Michigan School of Information.